A few months ago as I was cruising through social media, I noticed that one of the rescues we foster for, The Sato Project (you may remember them as the rescue that saved Carlitos and Maru), was involved in something called Spayathon. It was a collaboration between the Humane Society, the government of Puerto Rico, and 26 partner organizations coming together on the island of Puerto Rico to spay and neuter animals following the devastating overpopulation of stray animals on the island after Hurricane Maria. I immediately emailed to find out how to volunteer. After some back and forth, we were officially set to volunteer for the 3rd round (of 4 total) of Spayathon, as representatives of The Sato Project. We couldn’t have been more excited. 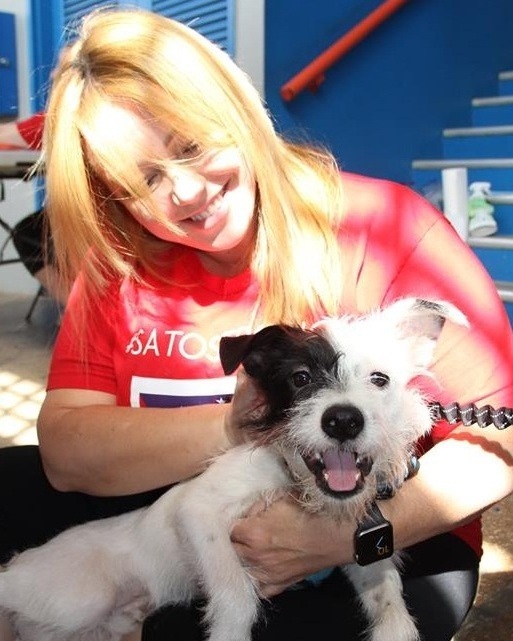 For 3 days we were set to volunteer alongside other members of The Sato Project, volunteers from an organization called Helping Paws Across Borders (who supplied the incredible vets and techs), and representatives of The Humane Society at the location in Fajardo. 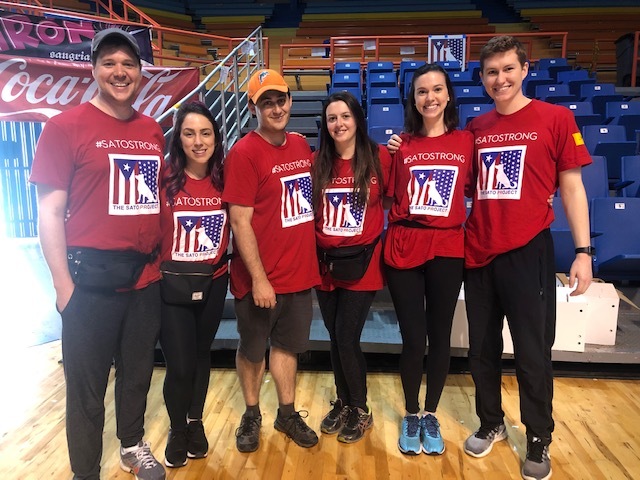 On February 6th, Eric and I, along with our friends Mollie and Pat (parents of @coopertakesbrooklyn), and Anna and Jamie (parents of @titotheminpin) headed down to Puerto Rico. We were asked to cover our flights, but TSP generously covered housing, and we stayed in the Air BnB home of a friend of the rescue right on the beach. Group Father Figure Eric drove us the 45 minutes to an hour every morning to the Spayathon site in Fajardo, and the 45 minutes to an hour back at night. Spayathon offered free spay, neuter, and vaccinations to as many people as could be seen in a given day. No strings attached, those who showed up and waited in line would have their animals vetted if at all possible. For many, it was the first time they were seeing a vet. At our location alone, in 7 days, over 1100 surgeries were performed, and additional vouchers were given out for animals we couldn’t accept (ex. animals with heart conditions, animals that were too young or small, etc.) Fun fact: the woman on the right in the photo below is Maru’s foster mom from Puerto Rico! I finally got to meet her and we hugged and cried and it was amazing. Some TSP team members at our location in Fajardo, photo courtesy of The Sato Project. Maru’s foster mom Daphne is on the right! 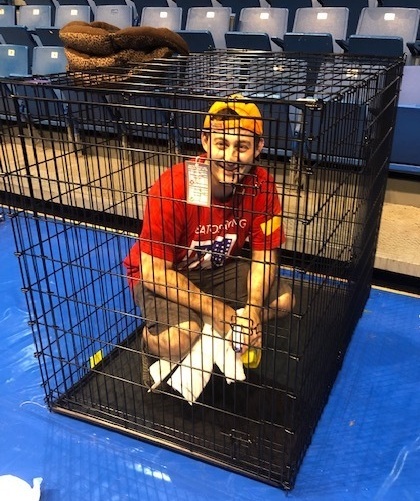 There were no small jobs at Spayathon. Some of us cleaned instruments, some of us made vaccines or cut up pills into appropriate sizes, some of us cleaned holding cages, some of us did laundry, some of us ran to the store for extra batteries or thermometers (or back to the store after we bought the wrong thermometers), and some of us worked directly with the dogs. Most of us rotated through a few positions based on what was needed. No one complained about the long hours (we were there around 10-12 hours a day, but the volunteers from the first half of the week had even longer days). It was an honor to work beside such dedicated volunteers, working to help make all these animals healthier and prevent thousands and thousands of unwanted future animals. 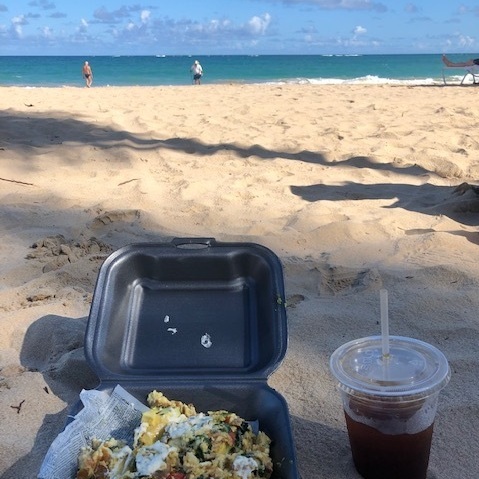 We also managed to have a lot of fun, eating a quick breakfast on the beach before heading in to volunteer every day, and sneaking in a mojito at our 10 pm dinners. We were able to walk around for an hour and to have breakfast in Old San Juan before we left, and it’s such a beautiful place to be. The gorgeous 85 degree weather didn’t hurt either. We loved meeting all the interesting people dedicating their spare time to this worthy cause. It was also amazing to meet the local owners of the animals- in fact, some were so grateful for the free medical care for their animals (many of whom were rescued off the streets after Hurricane Maria), they asked if they could come back and volunteer! It was so wonderful to watch the confused little pups after surgery totally brighten up, wagging their tails and running to their owners. Overall joining Spayathon was an incredible experience, and if the timing is right, we’ll happy go back to do it all again next round. If you’re interested in learning more about how to foster, adopt, volunteer, or donate to The Sato Project, visit their website, and here if you’re specifically interested in more information about Spayathon. The full team on the last day at Spayathon (many volunteers had already come and gone for their few days of volunteering). Photo courtesy of The Sato Project.